One of my go-to destinations during my lunch hour of late has been H Mart, a Korean grocery chain store located off of uber-busy Mira Mesa Blvd. As with most food fiends, I like to slowly peruse the shopping aisles and discover new food products. Others may think grocery shopping is a chore, but to me it’s something I’m always eager to do especially if it’s new, ethnic or I’m visiting a city. Aside from BBQ, the variety of banchan and bibimbap, I really don’t know much about Korean food except that I like eating it. In 2010 when food trucks starting coming into the limelight, I attended one of the first food truck fests here in San Diego. Featured at the fest were LudoTruck, Barcelona on the Go, ChompChomp Nation and Ahn-Joo. But I thought the whole event was a bust: long wait times in the freezing night air and an even longer time to actually get your food once you’ve ordered. That being said, the food at Ahn-Joo was terrific. Ahn-Joo specializes in Korean snack food. If given a choice between burgers or any type of Asian food, I would immediately chose Asian. The meal from the truck that night — although simple — was knock-your-socks-off amazing. 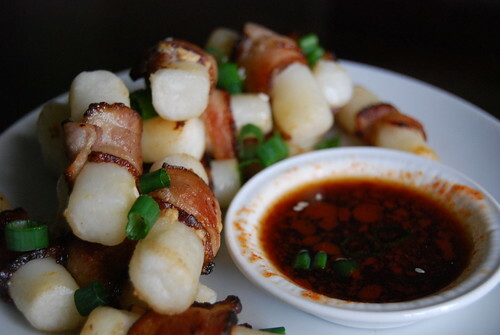 Pieces of bacon were wrapped around Korea’s version of rice cake, duk, and served with a jalapeño ponzu dipping sauce. It’s called “bacon wrapped rice cylinders” on their menu and I initially thought cylinders was just pieces of rice pressed together. I was wrong and it blew my world. 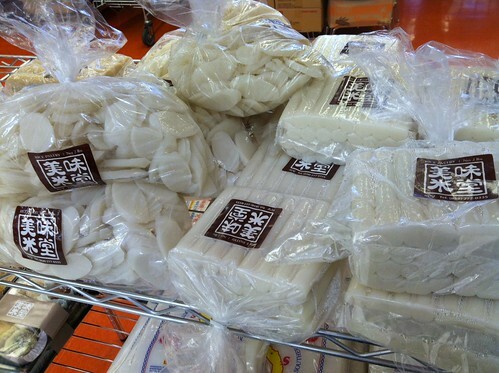 I didn’t think about that dish again until spotting Korean rice cakes at H Mart. The rice cakes come in different sizes: flat ovalish discs, uncut blocks and cylinders both thick and super thick. For the purpose of recreating Ahn-Joo’s bacon-wrapped rice cylinders, I bought the smaller of the two varieties available. (Two pounds retails for $3.99 at H Mart.) The only ingredients in the package I bought were brown rice, salt, water and no preservatives. I did a bit of testing prior to recreating the bacon-wrapped rice cylinders. (I’m also pretty sure I questioned Leanne of Three Dog Kitchen when I first initially saw them.) When the rice cakes are heated in a bit of oil, the exterior has a bit of a crunch but retains its toothsome texture. And served alongside a dipping sauce, it’s a simple but filling snack. Boiling them briefly in water makes them too soft and soggy. Pan frying, even grilling is the way to go. And deep frying these lovelies seems like overkill— unless you’re Paula Deen. There’s not much to the recipe. Wrap piece of bacon around each piece and cook until bacon is done. The simple rice cakes are elevated to high pork heaven: salty, a bit fatty and chewy all at the same time. Instead of trying to replicate the jalapeño ponzu dipping sauce, I added a little chili sauce to soy sauce and lemon juice. Posting a recipe for this seems ridiculous but here it is anyway. Heat oven 350 degrees F.
Slice rice cakes in half and set aside. Divide bacon in thirds to create 12 pieces. 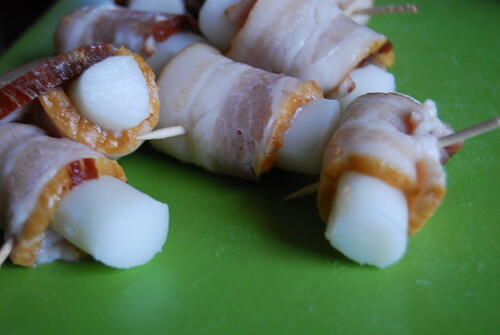 Wrap bacon around each rice cake portion and put toothpick through each piece to keep bacon in place. In an overproof skillet, heat bacon-wrapped portions until crisp, about 5 minutes. Move skillet to oven and cook until bacon is completely cooked. Drain pieces on paper towels. Sprinkle with green onions and sesame seeds. While bacon is cooking, mix soy sauce, lemon and hot sauce until combined. Serve with cooked rice cakes. To read more about H Mart, check out Pink Candles at Ridgemont High, This Tasty Life, Kirbie Cravings and Mmm-Yoso! I was just thinking about this over the weekend… now I’m even more tempted to try it. The crunchy outside/soft inside is what does it for me. And wrapping it in bacon must only make it better! Mmm..
I’m obsessed with them now and not just with bacon. I looked over the menu at Ahn-Joo and they also have Korean nachos using the rice cakes with cheese, kimchee salsa and pulled pork. I might have to try this next! Rice cakes with bacon…that sounds amazing. I will have to try this out. I had to laugh about your description of grocery shopping. I do that too- slowly peruse the aisles. It really annoys the heck out of the husband. Ha! Your husband too? We went to a grocery store “just to peruse” and Paul had three big yawns. One SO BIG that a sales rep commented how bored he must be. These sound yummy… and simple! They were! Anything with bacon is good!! Yum! They almost look like string cheese. Bacon wrapped string cheese. Mmmm. When they’re fresh, they have the texture of string cheese! 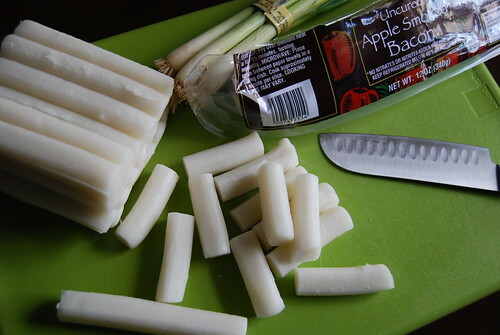 I was thinking that it looks like string cheese, too! Sounds like a really awesome snack. There’s so much to explore and see in H Mart, you really have to make several trips to check it all out! I must try this. Bacon wrapped around string cheese would be good too. Although I don’t think they would hold up to being cooked with the bacon. I always find something new at H Mart although sometimes if I don’t know the item, it can be daunting. I’m the same way, I love going to ethnic markets. i take FOREVER looking at all the different products and marvel at the graphics on their packaging. i also enjoy going to diff’t supermarkets whenever we travel. 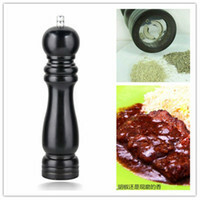 i like looking at their local products that you can’t anywhere else. i’ll have to make an excuse to go to H-Mart again just to find these! They’re my favorite thing. Even without bacon, I like to grill them up and eat them with sauce. Last time I looked, they had them near the cash registers.